Jeremy Gotsch looks over the merchandise. 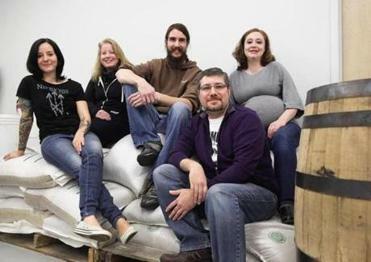 From left: Emma Thurston, Alison DeWolfe, Alex Thurston, and Jeremy and Jessica Gotsch own and run Damnation Alley Distillery in Belmont. BELMONT — The distillery gets its name from a legendary 19th-century downtown Boston alley that was once the bane of drivers who found it difficult to traverse after two-way traffic became the norm. Arguments arose, insults were slung, and thus Damnation Alley earned its moniker. 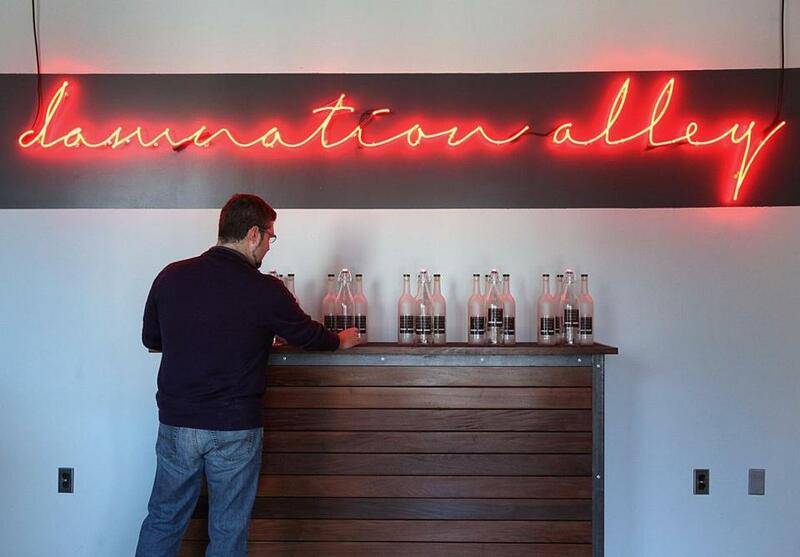 Despite the clever name and nod to local connections, Damnation Alley Distillery inspires nothing but good will. Wedged between a lawyer’s office and a digital printing shop near Fresh Pond, the distillery space, which is open to the public, feels like a cross between an art gallery and a science lab. The walls are a mix of white and grey with a few square portions painted black with chalkboard paint. Large plastic drums holding various liquids line one wall and feed sacks of grain pile up against another. A row of shiny 26-gallon stills twist up and down until their contents drip into clean glass beakers sitting atop chrome shelves. There’s a constant drip, like someone forgot to turn off all the faucets. Self-labeled “food nerds,” the distillery owners include sisters Jessica Gotsch, 33, and Emma Thurston, 36, their husbands, Jeremy Gotsch, 40, and Alex Thurston, 35, and family friend Alison DeWolfe, 41. The Gotsches and the Thurstons share a two-family house across the road from the distillery, where the group often gathers to make cheese, garden, and other DIY activities. Over numerous family dinners, they began to daydream about turning their urban-farming abilities into a profitable business. Opened since 2011, Damnation Alley Distillery, which the owners think of as so small, micro-distillery and nano-distillery aren’t good descriptors, is running six days a week producing small-batch vodkas and whiskeys made from Massachusetts-sourced materials. The distillery currently has three unaged single-malt Massachusetts whiskeys and three use-specific vodkas. Whiskeys include a 100 percent barley, a wheat-based, and a house special with a blend of grains. The vodkas have names like the Remixer (a mixing vodka), Nic the Sipper (a sipping vodka), and One Night in Bangkok (a burnt-orange, Thai chile-spiced vodka). Whiskeys cost $40 for 750 ml or $50 for 1 liter; vodkas cost $35 for 750 ml or $45 for 1 liter; and the Thai sweet chile vodka costs $40 for 750 ml and $50 for 1 liter. Their first six-month-aged barley whiskey, released last month, costs $40 for 375 ml and $100 for 1 liter. Alex Thurston serves as the resident home-brewer; he’s drawing on a decade of home-brewing experience with special techniques learned at a distillation workshop in Michigan. He explains that the preliminary processes for making hard liquor are similar to those for brewing beer. After grinding the grain by hand on a mill that he designed and built himself, Thurston combines brewer’s yeast, water, and a specific ratio of local grains to create a mash. Working with two barrels at a time, the mash ferments via a natural enzymatic process for one to two weeks. From there, he transfers it to the stills and heats the mixture to precise boiling points, allowing the alcohol to vaporize, rise to the top of the still, and condense. The liquor runs through the stills twice before being bottled by hand and fixed with a handwritten label. Customers pass the shop and frequently do a double take, turning around to ask, “What? There’s a distillery in Belmont?” Despite the disbelief, the Town of Belmont fully supports the distillery, helping the owners with planning, regulations, and the various licenses required for liquor production. 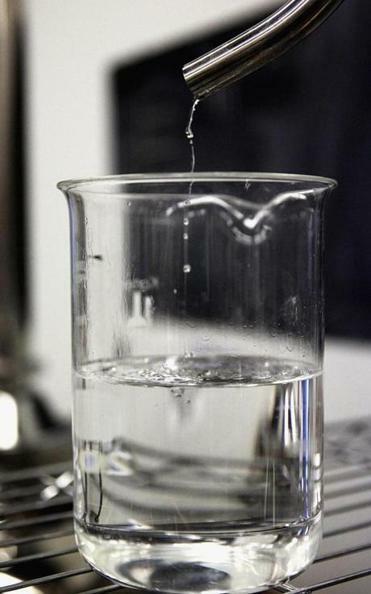 Damnation Alley functions with a unique type of license known as a Farmer-Distillery License, which caters to smaller facilities and simultaneously helps Massachusetts farms. Damnation Alley sources all of its grain – including corn, barley, wheat, and rye – from Bay State farms that specialize in heirloom and sustainable agriculture. Those same farmers return to pick up any spent grain to use as hog feed. Over time, the distillery owners hope to expand their use of Massachusetts produce. Thurston says, “If it has sugar in it, I’d like to distill it.” Talk of an Old World vodka using potatoes and the possibility of carrot brandy flits around the room. Jeremy Gotsch procures a handwritten list of flavor ideas as the others pull unlabeled bottles of chilled vodkas from a cooler. The group refuses to use imitation flavorings and instead experiments with ingredients — marshmallow root, honey, gooseberries, lemon balm, and shiso — grown in the family garden or sourced from local producers. Gotsch says he experiments with the ingredients to figure out the correct ratio of fresh and dried herbs or the amount of Wellfleet sea salt to add to savory vodkas. His current masterpiece: pizza-flavored vodka, a puzzling spirit infused with tomato, onion, pepper, garlic, basil, and oregano. They grew everything but the onions.